So my good friend Dennis' family came over here from Twin Falls for the Holiday. While they were here I wanted to get his Dad out fishing. I was targeting steelhead as that is what he wanted to catch. The only thing I hoped was that he would at least tangle with some leather-ed ole boot or something. After a few shameful looks, the two of them had the side drifting thing down and we were on our way. I came upon a run I usually get a fish out of and told them that if they could do this just right, we might be able to hook a fish. Sure enough 3/4 the way thru, Don's rod loads up and I tell him to smoke it!!!!! At first we weren't sure what we had, but after a minute or so we knew it was a Chinook. Now I had them using 1141's to do this type of fishing. This is a great steelhead rod, can be quite the work out with it and a steelie. A Chinook is a different story. The rod is rated for 4-8 lbs and we are using 8 lb leaders tied to #4 hooks. For all you non-fisherman out there, that is SMALL! Once we worked the fish over a bit, it figured out it was hooked and began migrating downstream. All I could do was follow. Don did a great job with the fight, only putting the right amount of pressure on the ole cow. After about 200 yards of river the fish decided to tuck into the bank and wrap us around some low hanging limbs. The current was such that I couldn't stop the boat there and ended up about 30-40 yards down river. I asked Don if he thought it was hung up and he shook his head yes. I jumped out of the boat and told him I was going to wade up there and see what was going on, be ready to real like mad! I was the only with waders, and I was up to about my waist when I got to the where the fish was. I pulled the line slowly and it felt solid in the branches. I thought to myself, at least he got a good fight out of it. Just as I was letting the line go I felt a tug, fish was still there. I yelled down river to get ready for a mad dash or a break away........I kicked my leg in front of me trying to spook the fish into doing something other than lie there. As I did, I felt something hit my leg very gently. I looked down and saw the tail of the fish right beside me. I gently grabbed the wrist of the fish expecting an explosion of water. Nothing. This fish was pooped from the battle it just went through. I told Don to get ready and I really clamped down on the wrist, nothing. I reached under the belly with my other hand and lifted the fish out of the water. I held it up and asked if they wanted it, it took a second for their mouths to close enough to say yes! I tossed the fish up on the bank and freed the line from the tree. I carried the fish downriver to the boat, the boys eyes as wide as they get. 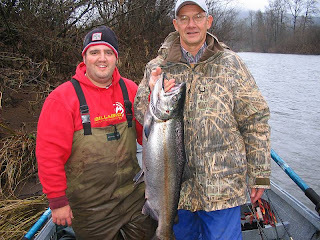 Don said he had never seen anyone land a Chinook quite like that, and I answered that is just how we do it in Oregon. Wink. Good job Don, you did me proud with a picture perfect battle! You sell your bike? I'm looking to ride more this summer. Love to see a picture of you walking the fish to them!